The strategy behind IBM GBS’ “Cognitive Enterprise” makes sense, but will it be enough to ensure success? You can have innovative and good, but it won't be cheap. You can have good and cheap, but it won't be innovative. You can have cheap and innovative, but it won't be good. Become the broker of capability for these technologies. GBS adoption is growing, but is the traditional setup capable of such drastic changes? Now we face the question of whether GBS is the right place to drive innovation. Should its role diminish into the background as merely a purveyor of low-cost, efficient, and high-quality services? Or will technology supersede it as the rise of automation, AI, and analytics renders its people-centric legacy approach irrelevant? 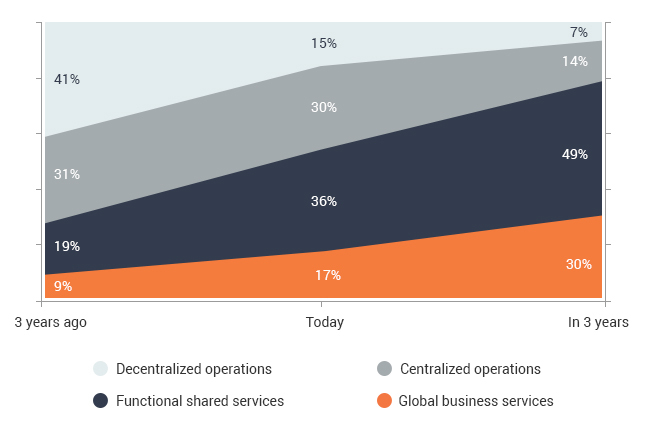 If there’s one thing we know, it’s that GBS adoption is dramatically increasing.In Exhibit 1, we can see this trend play out as GBS and functional shared services increase adoption to 30% and 49% respectively as both centralized and decentralized operations take a major hit. for delivering services today, three years ago, and in three years. Furthermore, a common theme is the need to expand the types of centralized services from traditional HR, contact center, and IT services to include the likes of legal, R&D, and corporate services. At a recent HFS summit, the digital lead of a major financial services organization said the key to getting value from GBS was moving it into new areas—particularly where you can leverage centralized data. He described using smarter analytics to drive better strategic planning and forecasting, essentially leveraging all the data from back-office functions to drive better decision making. This changing remit for GBS will quickly become a question of relevance to the changing demand of the modern business. In Exhibit 2, we can see the most common forces behind operational model transformation. Unexpectedly, cost reduction, the main driver of traditional business service amalgamation, sits at the very bottom of the list. However, this is likely because today, a reduction in cost is somewhat of a core expectation rather than a driver. All of the actions are expected to have the most optimal cost profile possible. Delivering tangible cost savings is becoming harder to achieve, particularly in the context of delivering a broader range of higher services; this is before we consider innovation. If your organization plans to change its operating model in the next three years, what are the main drivers for this change (top three)? 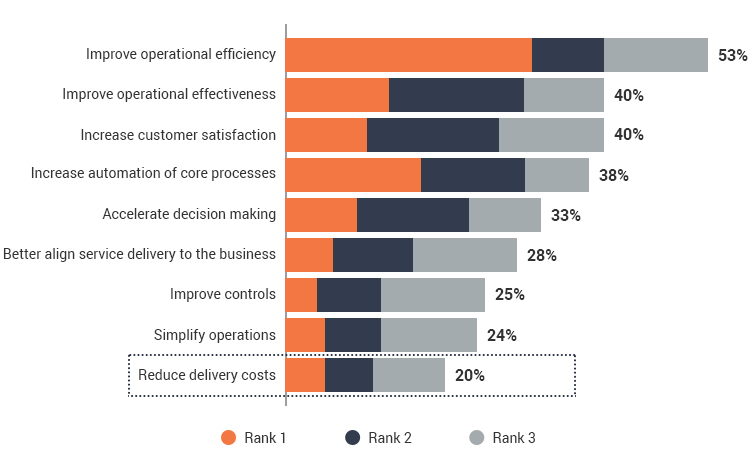 The tension within operations is clear from the data; the need to deliver efficient, effective services conflicts with increasing customer satisfaction and deploying automation technologies that drive decision making. The interesting part here is how broader strategic imperatives are creeping higher up the list of drivers. With increased efficiency and reduced cost as givens, management mindshare is shifting to broader objectives such as increasing customer satisfaction, which organizations could reach by streamlining processes, building more responsive communications, or embedding other drivers, such as increased adoption. In short, the remit of GBS is expanding as quickly as its adoption. Historically, organizations’ operating model priorities focused on driving efficiency. This priority remains, but it is less pointed in a world where large-scale cost savings and efficiency are hard to come by. The thought in many operations leaders’ minds is that automation may provide another dimension of efficiency. This means that both GBS and operations need a mindset shift. Increasingly, they are not the only players in the modern enterprise. Innovations and the evolution of business models have created competition across the business — from decentralized centers of excellence to the proliferation of business-unit-owned SaaS solutions. To rise to this challenge, GBS must leverage its scale, capacity to innovate, and business experience to become the center of innovation for the entire business. GBS must deploy automation to drive cost-cutting objectives while simultaneously freeing up valuable talent to enable business and technology changes. Business leaders and executives must view GBS as their greatest enabler for success, or else they risk falling to internal and external competition.